Today, Google announced about its new programme known as Google Shopping Actions. With this programme, users allow purchasing items through Google search and Google Assistant. 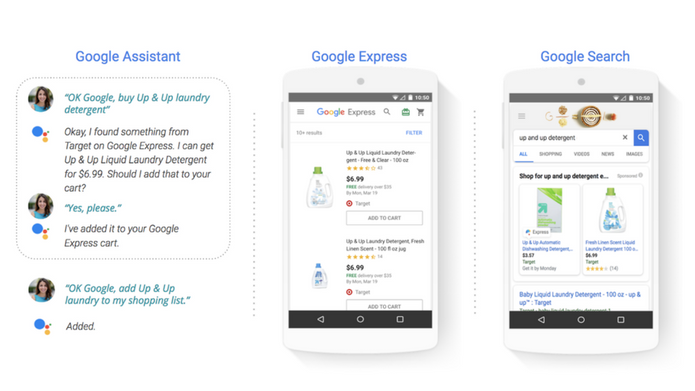 According, to this programme Google Shopping Actions, retailers can list their products on Google Search, as well as on the Google Express shopping service, and Google Assistant on PCs and mobile phones. Meanwhile, customers can save their payment credentials and purchases their item from retailers. Under this programme Google shopping actions, Retailers pay some amount to Google on each purchase in exchange. which is different from ad payments that retailers make to google for placing their ads. This will work like this when searching on Google for a shirt, You see a listing for a brand on of shirt then add it to your Google Express cart. Finally, Order it from your Google home. In case, later you decided to but pants also then both items will be added to the same Google Express cart and can be purchased together through. Google says,” Previously consumers asking for “Where can I buy this?” by the image searches of products”, “How can I buy it?”. So the ultimate choice of customers to go with Amazon purchase. This Google Shopping Actions programme, will be available in the United States(US) to retailers of any sizes. Considering the reports of the customers “where to buy products” had risen by 85 percent over the past two years, Thus Google started this new program Shopping Actions.